Infinity Cloud Review 2019: Is Infinity Cloud a Good Hosting? Established in 2012, Infinity Cloud is a web hosting provider based in Israel. They’re a small company that specializes in the provision of cloud services, virtual servers, server storage, and dedicated servers. Infinity Cloud has invested substantially in modern data centers and state-of-the-art technologies in a bid to deliver fast, secure, and stable solutions for businesses of all sizes. Infinity Cloud is an Israeli web hosting provider that specializes in the provision of cloud services, virtual servers, server storage, and dedicated servers. Though they’ve only got a relatively small market share in Israel, the company has the capacity to provide hosting solutions for SMEs as well as big corporations. The Infinity Cloud website is only available in Hebrew. Infinity Cloud has invested into modern data centers and state-of-the-art technologies in a bid to deliver fast, secure, and stable hosting solutions to businesses of all sizes. The vendor has data centers in Israel and abroad. Their VPS solutions are powered by an advanced cloud infrastructure that covers the entirety of Israel and their dedicated servers are housed in several server farms in Israel and beyond. According to the company, these come with an average uptime of 99.99%. This doesn’t seem to be backed up by a Service Level Agreement posted on their website though, so you may have to check with their sales representatives to ascertain the accuracy of this claim. Note that while Infinity Cloud does offer data backup services, these backups are for their internal use only. In other words, you’ll have to contact them in the rare event that you need to recover and/or restore your website data, which may prove to be a huge inconvenience. However, the vendor does offer to provide data recovery services based on the payment plan a customer is under. 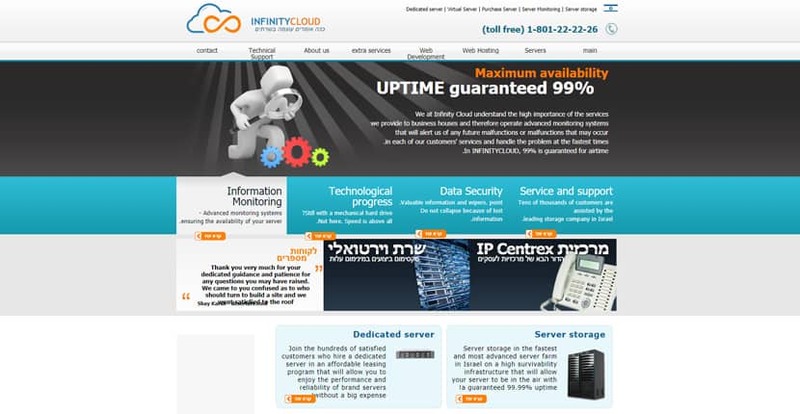 Compared to other Israeli hosting companies, Infinity Cloud’s hosting plans are reasonably priced. Even the most basic web hosting plan comes packed with some premium features including unlimited email accounts, advanced email spam filters, full control of your databases, FTP accounts, and so on — all at no extra charge. However, Infinity Cloud offers no money back guarantee, nor do they have a free trial period. All prices are listed in Israeli New Shekel. Infinity Cloud’s customers may contact the vendor’s support team via a toll-free number, an Israeli landline, and through their contact form. This hosting company has no live chat or ticketing system. Note that their technical support team is only available during Israeli working hours — that is to say, Sunday through Thursday between 9am and 6pm. However, they do have a 24/7 support center for emergencies. Sadly, my attempts to get in touch with their team were unsuccessful. I sent them a number of emails and received no response. Their phone numbers seem to be disconnected, making it quite hard to get any kind of help or hosting-related information directly from their support team. For a vendor that claims to offer 24/7 support, this is a big problem. Users considering Infinity Cloud should proceed with caution. Before purchasing any of their hosting plans, seek to have an in-depth conversation with their representatives and only purchase their hosting plans if your questions are answered satisfactorily. While their offers look good on paper, an almost nonexistent support team should give you pause. Wondering how Infinity Cloud stacks up against other Web Hosting companies? Enter any other Web Hosting company and we will give you a side-by-side comparison.